Fr Tim Deeter at the 60th anniversary celebrations of St Paul’s Church last weekend. Photo: Josh Low. 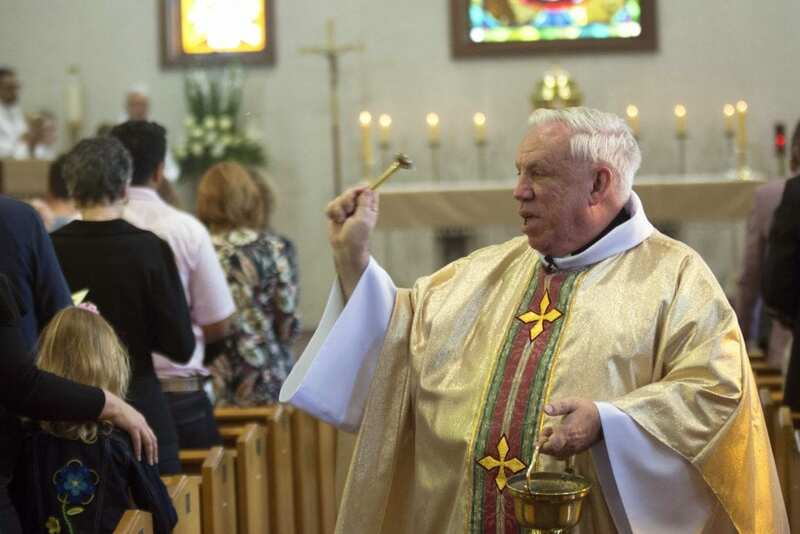 Three Masses were celebrated over the weekend by Fr Deeter, with visiting clergy assisting at each, with a parish luncheon that saw more than 200 parishioners and friends come together for the festivities. In his homily for the occasion, Fr Deeter said the anniversary of the dedication of the Church building to St Paul was a reminder for the parish to focus on God and the community of believers. He added that the anniversary celebrations were also an opportunity to ‘recall our own dedication as God’s people in Baptism, our own call to be holy and our continuing challenge to reflect God’s glory and greatness and beauty in the world’. “We need a somewhere, a special someplace, where we can pray – and pray together, because Jesus came into our world to save us as a people, as a community of believers who share faith in Him,” he said. “Our communication by phone and by email may be fast, but the effort to meet face-to-face seems more difficult. “We have people sitting together at a table with their phones, each one in his or her own little world, ignoring the others. But by coming to Church to worship together, face-to-face, we open ourselves to the task of forming community,” Fr Deeter said. “That is an essential part of being a Christian: being part of a community, recognising that we’re part of something bigger. “We cannot come here simply for ourselves; we must ‘hang together’, because – as St Peter reminded us – we are a chosen race, a royal priesthood, a holy nation, a people set apart,” he said. Fr Deeter explained that by coming to Church to worship together, face-to-face, we open ourselves to the task of forming community. Photo: Josh Low. Speaking to The eRecord, Fr Deeter said a reverently celebrated liturgy with homilies relevant to the people, close ties to the parish school, solid adult formation in RCIA, bible study, the promotion of traditional devotions and Catholic teaching about the liturgy, the saints, and moral teachings are crucial to parish life. He added that it is a big task to handle, but draws inspiration from the writings of St Paul in his letters to the Corinthians and Colossians. “It requires a lot of extra work and commitment on my part, but as St Paul says, ‘Caritas Christi urget nos’ (the love of Christ spurs us on), and “I must fill up in my own body whatever is yet to be fulfilled in the sufferings of Christ,” he said. “Today is a day to be grateful for what has been accomplished in the past, to be proud of what we ourselves are doing in the present, and to pray for those who will follow us in the future. “We gratefully remember our past and continue walking in the footsteps of our forebears along the path which has brought us to this happy day, 88 years after the first gatherings for Mass in the Upper Room of the Learoyd Street School, and 60 years after the dedication of this Church, St Paul’s on Rookwood Street,” Fr Deeter concluded.